Professor Kathleen Gallagher, Ph.D., interacts with people from recently liberated slave populations in Kohalpur, Nepal. Kathleen Gallagher, Ph.D., has lived a life filled with adventure — and a bit of danger. She spent seven years trekking around Nepal, lived through a strong earthquake there and once witnessed her Nepalese classmates being arrested during a major political shakedown. 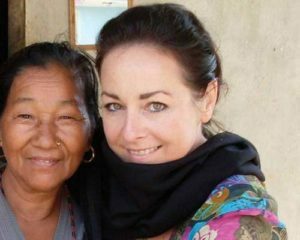 Her time in Nepal wasn’t easy, but it shaped her both personally and professionally. “I have lingered there literally and metaphorically hoping to better understand the processes of exclusion and dispossession,” said Gallagher, Assistant Professor of International Relations at St. Mary’s University. For the past five years, Gallagher has been teaching at St. Mary’s, but her heart is tied to Nepal. Her coursework and many of the initiatives she’s led on campus are reflective of her passion. She spearheaded a new scholarship program designed to help outstanding Nepalese students study at St. Mary’s. It focuses on those who seek to make a difference in less-developed regions in the world through research and practical initiatives aimed at sustainable and transformative development. Gallagher has also formed workshops geared to help international students adjust to the rigorous graduate programs at St. Mary’s by helping them understand cultural differences and academic expectations. Sami Wagle (M.A. ’14), who is Nepalese and a recent International Relations graduate, is one of many students who received opportunities, thanks to Gallagher. She recently served as Gallagher’s research assistant for a grant from the University of Texas at Austin’s South Asia Institute. Gallagher also helped Wagle obtain an internship at the Center for Refugee Services in San Antonio. It’s this kind of mentorship that builds a strong connection between Gallagher and her students. “I want them to be thoughtful about how they can radiate these skill sets and this knowledge, their theory, their analytic skills and their critical reflection out into the world in a transformative way,” Gallagher said. To help in the aftermath of the recent massive earthquakes in Nepal, Gallagher and current and former students have created a student organization to promote relief initiatives. In early May, Gallagher sat down with Wagle and Krita Bhattarai, another Nepalese International Relations student, and decided to focus on decreasing the dropout rate of Nepalese students affected by the earthquakes. Wagle and Bhattarai are both coping with being separated from their families who were displaced after the first big earthquake and left camping outside. Despite their feelings of helplessness and heartache, Gallagher, Wagle and Bhattarai realized this atrocity was also an opportunity to help others. “We wanted to channel our energy into something good,” Bhattarai said.